This week has seen a bit of rebellion against my own rules. I’m not sure whether it was brought on by an overindulgence in chocolate, a bank holiday or the fact I’m at home whilst the children are at school/preschool because my school has different term dates. Anyway, whatever the reason, this week there are THREE WIPs! The first is a simple stash buster, an Attic 24 cosy stripe blanket for my son using the leftover yarn from my husband’s gigantic granny square blanket. This is a project that will be slower paced, with the aim of it being completed before their boys’ camping trip in the Summer holidays. It’s a lovely, simple pattern for when I’m watching TV etc. I’m 8 rows in already, so I’ve got a good start. The next project is an experiment, which may or may not ever be completed. I wanted to make some baskets for my bedroom, and this chunky cream chenille sparkle yarn which I bought from Aldi in the autumn seemed perfect. It’s quite rough, and not something I’d like a blanket made from. However, I thought it would make lovely chunky baskets. 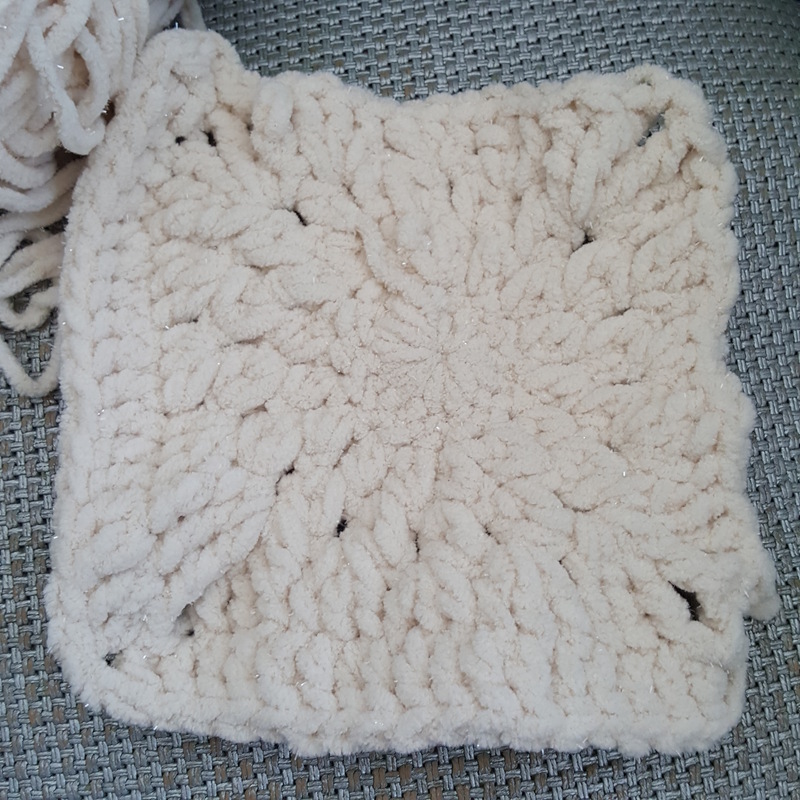 I am making up the pattern, so far the base is a sunburst granny square which I’m just going around in treble crochet until it’s the right size. It’s another no rush project, but it’ll work on it when I’m in the mood for thinking and calculating! The final project is a ‘need to get finished’ one. I started a mermaid tail for my niece but realised I didn’t have enough yarn and couldn’t get more to match. I bit the bullet and bought 3 x 200g balls of James C Brett marble chunky in these gorgeous blues, greens and purples. It’s to be completed by June, but it’s my priority at the moment so will hopefully be completed fairly quickly! After that exhausting round up, I’m wondering whether three WIPs is pushing the boundaries a little! What are you working on this week? How are your projects coming on? Feel free to share links to your instagram etc so I can take a look! Previous Post Bargain Hunting Season Begins! I should be working on the first stage of birthday cake baking for Pickle’s party on Friday, but instead I have brought my knitting and a skein of yarn to wind to my friends house to do some emergency babysitting. I may have to resort to a shop bought cake as I don’t think I will have time to get it done tomorrow! Not to mention I haven’t actually planned what I’m baking! Hum one kind of is 🙂 but I really need to finish another one because it’s due for next week! I need to get crocheting! I always have multiple WIPS at once…I’m wondering what your rule is and how you stick to it? I only like to have 1 or 2 on the go at once, and I just make myself finish one before starting another. I’m loosening up a bit now though, I just don’t like having lots of half finished things lying around. I’m always struggling with that. I try to keep the number of projects on the go to a reasonable number, but there are so many things I want to make! Me too, I just have to keep a list of future projects. I’m easily distracted by things to experiment with though! Good luck with that mermaids tail, it should be quick going with chunky yarn. 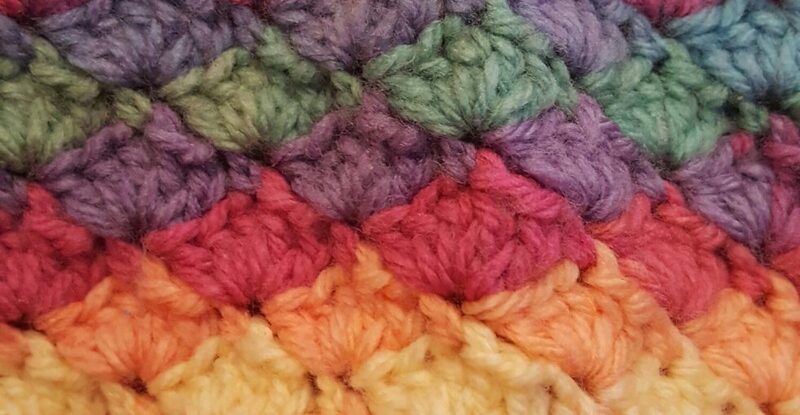 Ooh that chunky yarn looks fabulous! I have not counted my WIPs, but I suspect they may have just snuck into double digits. Oops! Thank you, I only made a cushion with it so thankfully it was only a couple of weeks! You are so good to just have three WIPS. Good luck with them all. I am actually sitting here on my sofa with a blanket next to me – knitted in James C Brett Marble Chunky ! 😊 it’s pretty yarn isn’t it! I think it makes sense to have a mix of simpler and more complicated projects on the go at the same time. Sometimes we want busy hands but a relaxed brain! Phooey! Hope you get better soon! Wonderful projects! Can’t wait to see the glittery yarn turned into a basket! Sometimes having several projects on the go means you don’t get bored with any one of them, hopefully this is one of those! I think it probably is, no chance of boredom here! Thanks, my friend has had a go at it for me (she’s a massage therapist). Serves me right for crashing the pushchair into a kerb! 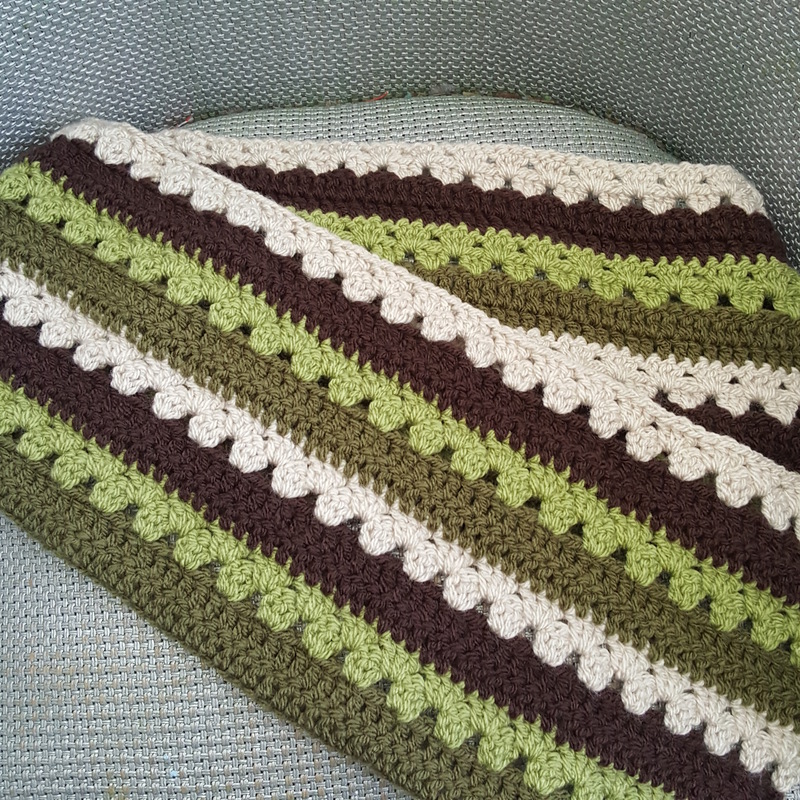 I love your choice of color in the blanket , I went straight to the Attic 24 found the pattern and will be making this one. Thank you for the inspiration ! I only ever finished a few cross stitch pictures, I love them but I’m too impatient! Good luck! I love the start of the next project. You are very good to have so few projects on the go. Between knitting, quilting & papercrafts I have several! I did see a comment on cross stitch too – I think there is one of those somewhere too! Haha, thank you. I often make cards but they aren’t a WIP for long! what beautiful projects-as always-I be the sparkle yarn will be beautiful and the blues-oh my! Thank you, the blue/purple/green is making very pretty mermaid scales so far! oh-can’t wait to see that! I know all three will come out well.. Everything you touch you have that magical touch which comes out beautifully.. 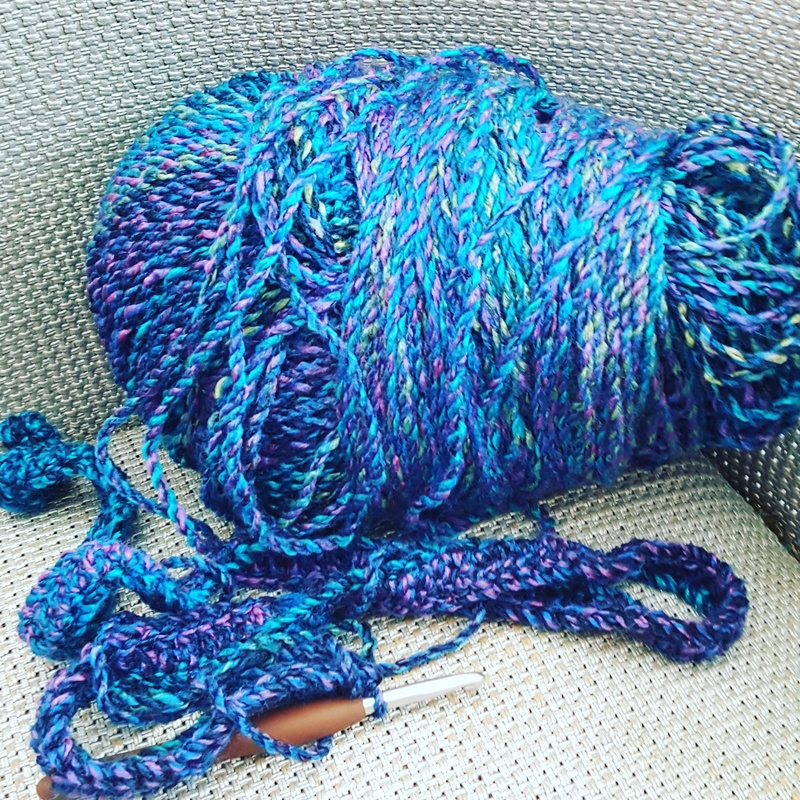 Absolutely gorgeous yarn for the mermaid tails! Quite jealous I will admit. I’m looking for the perfect yarn to start on the tail I’m making for my best friend. Maybe I’ll have to look into buying some of this! Thank you, it is working up really nicely now and the scales show up well with the variegated colours.